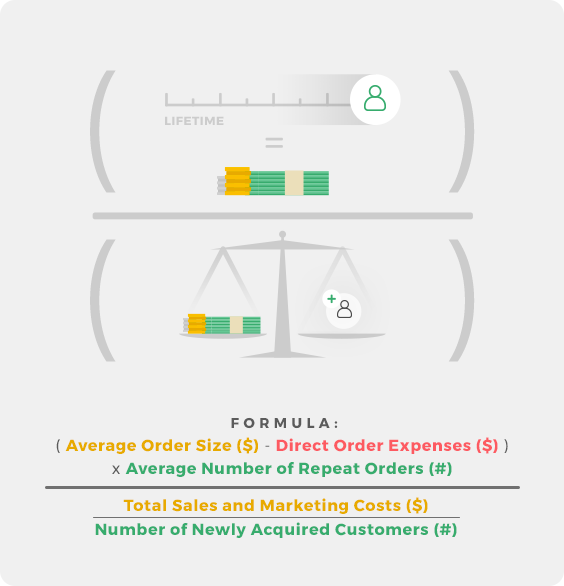 This refers to the ratio between Customer Lifetime Value and Customer Acquisition Cost. It is crucial metric to determine if your company is spending too much to acquire a customer or too little to get new customers and therefore evaluate the long-term sustainability of your business model. LTV/CAC is mainly used by Saas Companies, E-Shops and other business models based on repeating/subscription orders. E-Shop sells T-Shirts at 20$/piece, with direct production costs 10$/piece. The e-shop spends 10,000$ a month on sales and marketing to acquire 100 new customers. An average customer orders 5 T-Shirts (100$) and repeats the order 5 times throughout their lifetime. What does what ratio mean? Bad LTV/CAC (<1) = You are spending more money on acquiring a customer, than you make on them throughout their lifetime. You are losing money and your sales/marketing isn’t effective. Neutral LTV/CAC (1) = You make just as much money on a customer, as you spent on acquiring them. You aren’t making any real profit on the customers, but you aren’t losing money either. Good LTV/CAC (>1) = You are making more profit on a customer, than you spent acquiring them. Getting more customers like this will be profitable for your business.